On a recent visit to Berlin to sample cake we spotted this majestic 1880’s egg cooker in a museum. Designed by the electrical company AEG it was designed to make “housework easier!” You can just imagine a terribly fashionable Lady inviting her friends to tea and amazing them, not with yet another spread of daintily decorated fairy cakes, but by removing a perfectly cooked egg from this futuristic new silver cooking contraption. Nowadays it’s getting harder and harder to impress people but a gift of some of your chicken’s eggs can melt the hardest heart, especially if you also include a novelty egg cup. 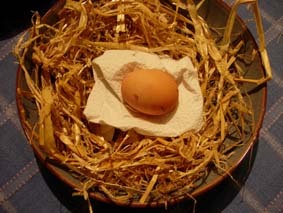 Browsing the egg gallery on the omlet forum you can find quite a collection, it’s like a virtual museum of egg cups! 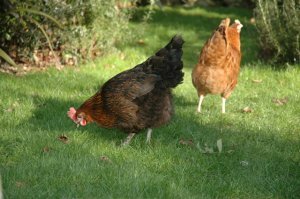 On another note we have prepared an “all you need to know” fact sheet about the current avian flu situation which you can find by either clicking the above link or in the Club area of the Omlet website. And don’t forget the pumpkin carving competition, dozens of entries have arrived in the omlet mailbag already. The closing date is the 31st of October so still plenty of time and the prize is a £20 Omlet voucher to spend in our shop – yippee! Send your entries to johannes@omlet.co.uk. (don’t worry he’s not easily scared so make them as spooky as you like). I’ve been buying free-range eggs for as long as I remember. I think it comes from reading as a teenager about the appalling conditions that poor battery hens have to endure which made me want to buy my eggs more ethically. However, since my lovely hens came into my life, my thinking has changed even more. We’re not vegetarian because the rest of my family would starve within a week faced with vegetables only but I suddenly twigged why the shrink wrapped chickens on the supermarket shelves were so cheap – they were battery hens too. That really upset me so I now only ever buy free range organic when we want meat on the menu because that guarantees that the animal has at least seen sunshine, felt the rain and had the wind ruffle its feathers or skin before it died. Somehow the thought that it had a happy life as opposed to being cramped in a tiny, artificially lit cage makes me feel better about eating it – if that makes any sense! We also grow more of our own fruit and vegetables now than we ever did before we had hens. I think the lovely fresh eggs every day make you want to have a better way of life. Why eat carrots and apples which are covered in chemicals when you can go out and pick your own, fresh from the plot for a little effort and the pleasure of watching them, grow or buy tasty organic ones from the Farmers Markets. 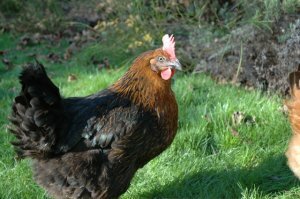 I’ve noticed that so many Omlet forum members have also started to want more of The Good Life now that they have chickens brightening their lives and that is such a good thing. Is it me or do my ears look big in this? 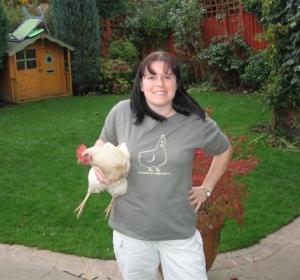 Got the eglu, got the chickens, now collect the t-shirt! What do you use to clean the Eglu? Dawn (Peckham) asked “I wondered what cleaning products people are using on their Eglu? If you were stranded on a desert island what luxury item would you have? my hair dryer! Do your chickens have a party trick? 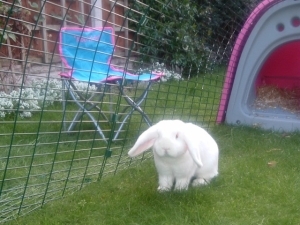 Both are very good at jumping onto the top of the garden gate – trouble is they haven’t quite mastered jumping off so are quite easy to retrieve! This full length shade covers the top and one side of the run. 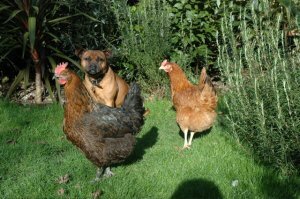 It is also of course handy if you are keeping your pets in a windy or rainy part of your garden in the winter months and will keep your little darlings looking great all year round!